BEST VALUE! NO CONDO FEES - IMMEDIATE POSSESSION. Welcome to 52 Sunset Road in lovely Cochrane, Alberta. 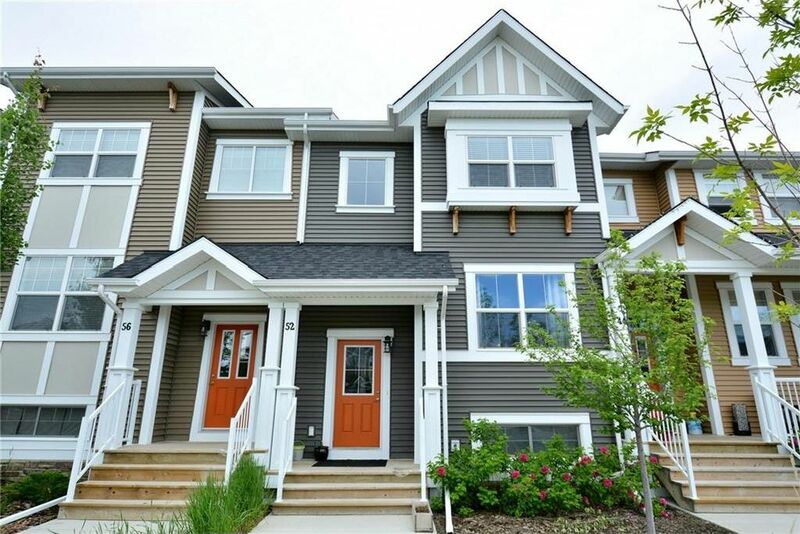 This lightly lived in townhome will get you started on the path to home ownership. It features a great OPEN FLOOR PLAN, with a living/dining area, well laid out kitchen with STAINLESS STEEL APPLIANCES & a breakfast bar, rich laminate flooring, 1/2 bath on the main, 2 LARGE BEDROOMS & 2 FULL BATHS up (one ensuite), UPPER FLOOR LAUNDRY, and is move-in ready. It comes with its own PRIVATE FENCED YARD and DECK for BBQing or just soaking up the sun. 2 PARKING STALLS at the back, as well as street parking in front. The large, undeveloped basement is well thought out, with a rough-in for a future bathroom, 2 large windows, and all of the mechanical items tucked in the corner for maximum space. This great home is just steps to a central park and a 6 acre freshwater pond with fountains, a playground and a new school. Don't delay - this is simply great value.